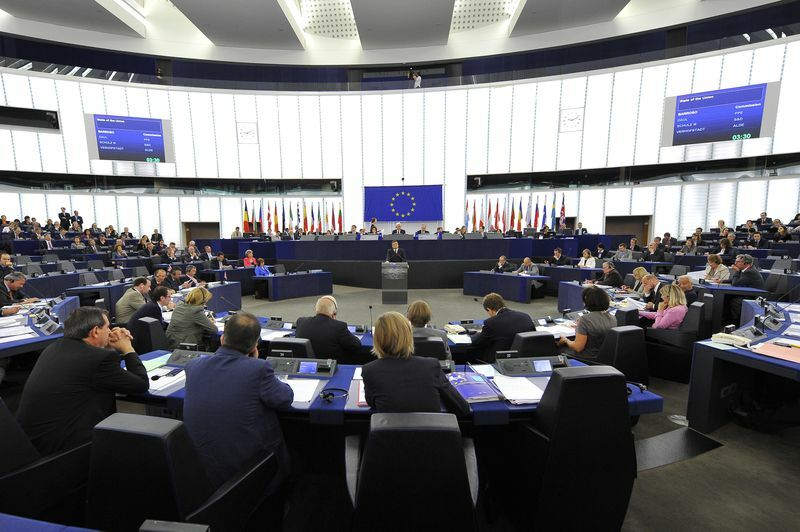 A lot of passion, a lot of Europe and a lot of love poured during the three-hour long debate in the European Parliament on September 28 which started with the already traditional annual State of the Union Address of European Commission President Jose Manuel Barroso. Even more intriguing was that the four big political groups in the European Parliament - the right, the socialists, the liberals and the greens - welcomed Barroso's address and stood entirely behind it. Only the nationalists opposed another call for more Europe. Jose Manuel Barroso started his address with the words that an honest approach was needed for the analysis of the situation. "Today we are facing the biggest challenges our Union has ever faced in our history. Not only a financial and economic crisis but also a crisis of confidence". He spoke also about a European renewal, about a sort of renaissance and emphasised on unity and integration. Since last year he has introduced the American presidents' practise to annually address the nation about the state of the union, Barroso borrowed another thing from the White House - the former slogan of Barack Obama "Yes, we can", by stating: "Yes, we can exit this crisis. Not only that we can, but it is necessary". The only way this to happen, though, is through deeper integration. According to him, it is now time for a unified external representation of the euro area, which is probably an euphemism for a eurozone government, of which France and Germany already spoke by even suggesting that its leader should be Herman Van Rompuy, the current European Council President (of all the 27 member states). Part of the deepening integration should be the creation of a Union of Stability and Responsibility built on the basis of a common approach that will "also allow the Member States to seize fully the advantages of a bigger market for the issuance of sovereign debt". The European Commission president also spoke about the Eurobonds, but he preferred to call them Stability Bonds whose purpose would be to reward those who play by the rules, and deter those who don't. It is expected the Commission to come up with a concrete proposal on the matter, but what became clear so far was that they will not be called Eurobonds but Stability Bonds. This, however, will require treaty changes. "And this is important because, Honourable Members, we can do a lot within the existing Treaty of Lisbon. And there is no excuse for not doing it, and for not doing it now. But it may be necessary to consider further changes to the Treaty". And it was here that the president uttered the key sentence in his 41-minute long speech: "I am also thinking particularly of the constraint of unanimity [he means here the unanimity rule in the Council for taking decisions]. The pace of our joint endeavour cannot be dictated by the slowest. And today we have a Union where it is the slowest member that dictates the speed of all the other Member States. This is not credible also from the markets' point of view, this is why we need to solve this problem of decision making. A Member State has of course the right not to accept decisions. That is a question, as they say, of national sovereignty. But a Member State does not have the right to block the moves of others, the others also have their national sovereignty and if they want to go further, they should go further", Barroso said ardently. 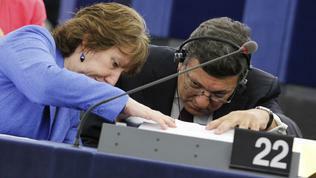 Contrary to the expectations, President Barroso made almost no new proposals. On the contrary, he again underlined, without enumerating everything, the Commission's legislative initiatives for the past year and concluded with the mantra that the time had come for implementation, not for new ideas. He was vehemently applauded in the minute he spoke about taxing the financial sector with a financial transaction tax (FTT). He defended this proposal with the fact that for the last three years taxpayers had granted aid and guarantees of 4.6 trillion euro to the financial sector. "It is time for the financial sector to make a contribution back to society", Barroso said, again entirely in the spirit of the messages Barack Obama is conveying in Washington. 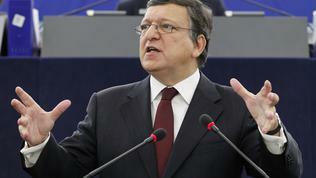 According to Barroso the FTT proposal will generate over 55bn euro annually. This is also the most controversial area not only at a European level. Many countries, including Bulgaria, are against such a tax, especially if it is to be introduced before it is agreed on a global level. The European Commission thinks, though, that this tax would be a very appropriate generator of revenues for the common budget of the EU and was for the first time formulated in the Commission's proposal for the next multiannual financial framework for the period 2014-2020 (MFF). Barroso again emphasised on the need of creating economic growth and jobs. According to him Europe already has its own jobs plan (similar to the American one proposed recently by Mr Obama) and that is the Europe 2020 strategy. Currently one in every five Europeans is looking for a job. The Commission will focus on the situation with young unemployed people in every member states and will make country-specific recommendations next year. In his speech President Barroso has paid special attention to Greece by saying that Greece is and will remain a member of the euro area. 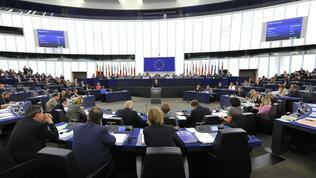 He recalled what had been done up to the moment and again called on the Greek government to implement its commitments. Regarding Greece was another key sentence from his speech: "Moreover we should do everything possible to accelerate the entry into force of the European Stability Mechanism (ESM)". This is the permanent rescue fund of the euro area agreed with minor treaty changes in the beginning of this year with the aim to replace the current temporary fund (EFSF). The ESM is agreed to start functioning as of mid-2013 but, as back then euinside forecast it might be necessary the fund to be enforced earlier. Of this wrote German magazine Der Spiegel by revealing recently from sources of its own that the idea of an early activation was being discussed in Berlin. Obviously not only in Berlin but in Brussels too. Put an end to unanimity! 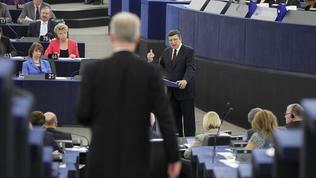 Barroso's address was met with surprising unanimity in the European Parliament. And if this was expected from the majority from the European People's Party, for the rest it was a surprise, although most group leaders are known for being euro federalists. 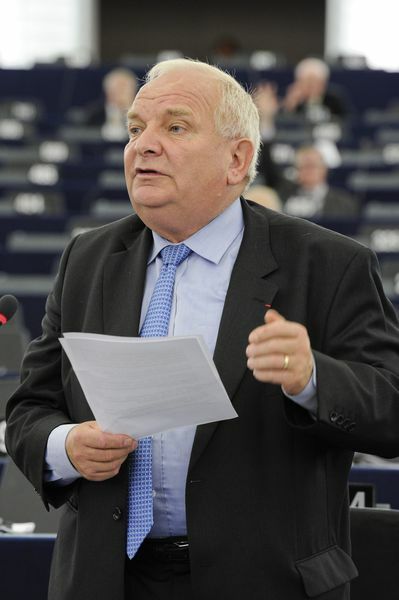 EPP's group President Joseph Daul also said that currently Europe was suffering from a confidence and growth crisis, as well as from leadership crisis. He was first to unleash the inflaming of passions against the intergovernmental method, applied by some member states because of narrow political party interests, by saying: "Reforms are being decided through the intergovernmental method which is clearly paralysing Europe!" "Ladies and gentlemen", he went on, "the national method must give way to the European method, the Community method, which is the only one which will allow us to resolve, in a united and effective manner, the urgent and major challenges before us". 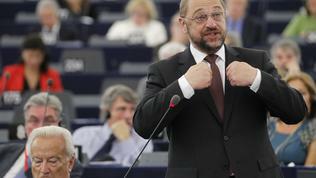 With an amazing vigour Barroso's speech was welcomed by the socialist leader in the European Parliament Martin Schulz. As usually, he did not read from a preliminary prepared speech and indeed gave everything to say that Barroso's analysis of the state of the union was realistic. "It's something we've waited for for a long time to see you at the heart of the European institutions, showing a combative posture, and we've seen you energetically defending the community method. We think this is the right way forward". According to him, the essence of the current crisis is that there is no longer certainty. If before people believed that the irreversibility of the European project was certain, now this is no longer the case. "We have a crisis of management and a crisis of leadership. 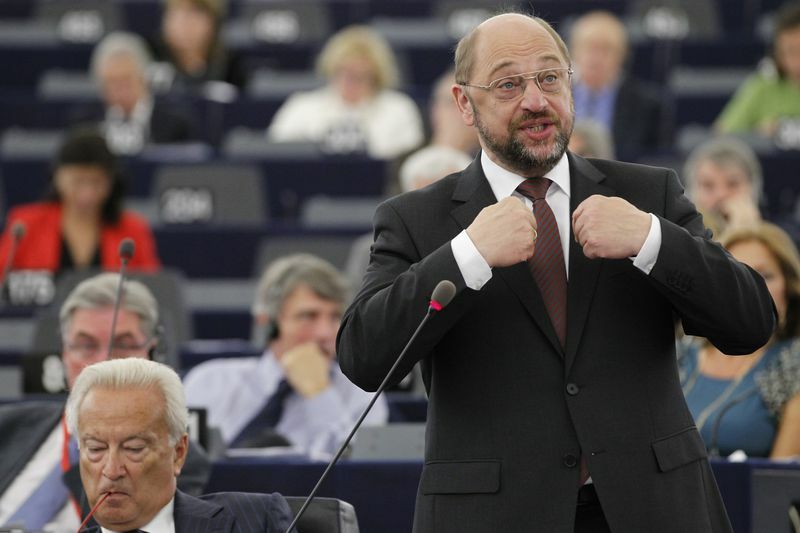 Of flourishing intergovernmentalism", Martin Schulz exhilarated. To such an extent has this intergovernmentalism grown that neither the Council, nor Coreper make any decisions anymore. "What we see is a reversal to diplomacy between the capitals. This kind of a patchwork diplomacy, that's been imposed on us, where political opportunism holds sway, where party political manoeuvring is more important than the global monetary stability, that is why we've got a crisis in Europe", the socialist leader added even more passionately. 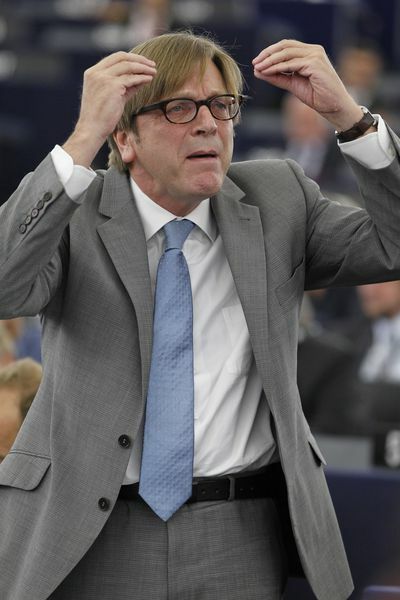 He was followed by the always ardent, but this time having surpassed even himself, leader of the liberals and former prime minister of Belgium Guy Verhofstadt. He again underscored that the current crisis was not about Greece, nor was it about the Greek debt. "This is a crisis about the euro, about the European Union, and a crisis today about the existence, the vital existence of the EU". He was also about skipping unanimity, as a mechanism of decision-making in the European Union, and called on Barroso to prepare urgently an action plan and to table it to the EU leaders on October 17th in Brussels, when the October European Council will start. 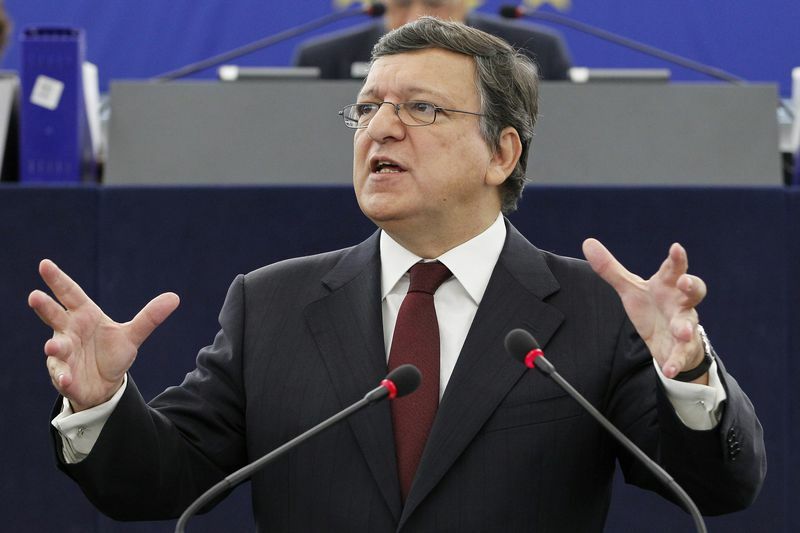 He emphasised several times that Barroso had to outrun the leaders by coming up with several proposals because thus he would prevent intergovernmentalism and would prevent member states from filling the vacuum. He also called for organising the economic government of the euro area but reiterated that this should happen within the European Commission. Guy Verhofstadt is from the outset an opponent of the Franco-German idea for a eurozone government headed by Herman Van Rompuy. 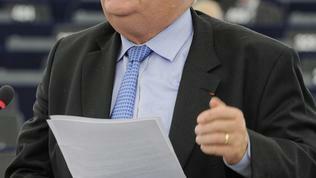 "Now what we have: Mr Juncker, Mr Van Rompuy, Mr Olli Rehn, the ECB - we have at least five people representing Europe. We need one that has to be a commissioner, a senior commissioner. Make him a minister of finance and over! 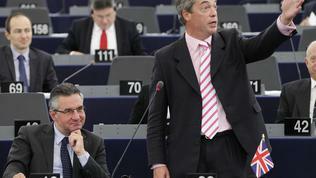 ", the former Belgian premier said against the backdrop of strong applause. The enthusiasm of the leaders of the bigger political groups in the European Parliament was dashed by the conservatives and nationalists. Jan Zahradil (European Conservatives and Reformists) started his statement tauntingly: "Mr President Barroso, how are you by the way, how do you feel? I have to admit I feel a lot of sympathies for you because I believe genuinely that you are aware that the situation is serious, and I have to admit at the same time that I don't share many of your views". According to him, people already had lost confidence in the institutions and offering them more Europe was just ridiculous. Mr Zahradil quoted a recent poll, according to which people no longer liked the idea of federal Europe and called this not to be named propaganda but to be recognised that people have opinion. Most exuberant, as usually, was the statement of the co-president of the group Europe for Freedom and Democracy, the Brit Nigel Farage. I think it will be better if I present you almost literally his statement, as well as the response he got from President Barroso so that you can get as closer as possible to the atmosphere in the house. Nigel Farage: "Now, as a former communist yourself, you probably remember the old soviet leaders getting up to give their speeches and telling everybody that there was a record harvest, or that tractor production figures were terribly good. And they, of course, believed that history was on their side. President Khrushchev got up and said to the West: 'We will bury you'. You know, so much that he believed in his own union. Well, now of course we look back at them and we laugh. And I think, in our tomorrows, people will look back at you and they will say: 'How on earth did this unelected man get all of this power? And how did Europe's political class, sitting in this room, decide that the community method should replace national democracy'. I think people will look back in astonishment that we've surrendered democracy. [...] Because, just look at the confusion - we've got you as the president of the European Commission, we've got presidents of the European Parliament, we've got my old friend Herman Van Rompuy, who is the permanent president of the European Council. We've got the Poles, they are now presidents temporarily of the European Council. We've got presidents all round this room. Goodness me, even I am a president. I mean, I'm not sure what the collective noun for presidents is, perhaps it's incompetence, I don't know. [...] So, I'm very worried about the roots of this union - there's a new nationalism that is sweeping Europe. You want to abolish the nation states - in your case, Mr Schulz, perhaps because you're ashamed with your past - and you now want this flag, and a new anthem to replace nation states, and you don't care how you get there. If you have to crush national democracy, if you have to oppose popular referendums, you just sweep this aside and say that it's populism. But it's not, it's democracy! And what is sweeping northern Europe now, starting off in April with an amazing result in the Finnish general election, is that there is a new democratic revolution sweeping northern Europe. It's not anti-European. It wants a Europe of trade, it wants a Europe of cooperation. It wants a Europe where we can do student exchanges, where we can work in each others' capital cities. It wants those things. But it does not want this EU model. 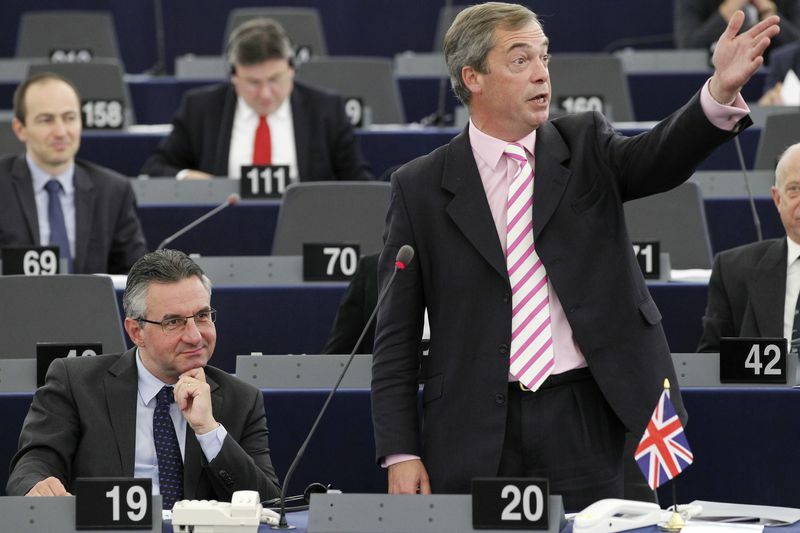 Frankly, you are all now yesterday's men", Nigel Farage concluded with a special vigour. But I think the majority here believes, as was said, that to protect our interests, to defend our values in the world of globalisation, to speak with one voice with our American friends, or China, or Russia we need a stronger EU. This is why I welcome this message of support from the most important political forces here, and the consensus expressed, but I also welcome the message of support coming from the current presidents of the Council from Poland. Some of you said today 'yes, but'. Please, we are all pro-Europeans, don't say the buts! Say just yes! You don't say to your loved ones - your wife or your girlfriend, or your husband, or your boyfriend -you don't say 'I love you but'. 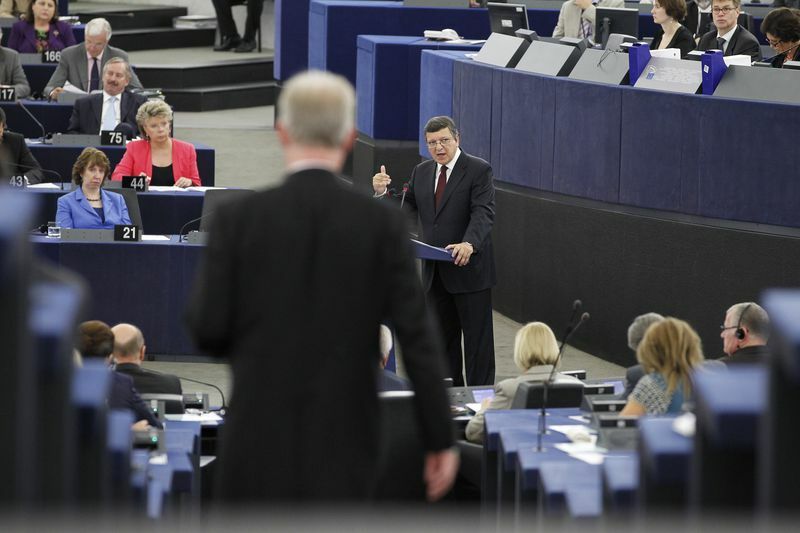 You say: I love you, I support you and we need your support to make Europe stronger", Barroso concluded with an exceptional ardent and emotion. It is getting more and more obvious with every major debate in the European Parliament that the EU is indeed facing a crucial decision. A decision for which the Union is not ready neither politically, nor culturally, but economically it is forced to. The world is regionalising and is dictating the rules. The EU no longer has the luxury of time, global order and public enthusiasm to build new ideologies. The path is clear - forward with a federation or backward to 'everyone being on their own'.